At least 20 people have been killed and many others injured in a spate of bomb attacks in the Iraqi capital, Baghdad, and two nearby towns. The most deadly was caused by a car bomb in the mainly Shia Sadr City area. The same district was hit by a massive truck bomb two days ago that killed more than 60 people and was claimed by Islamic State militants. Sadr City has been the target of several bomb attacks this year claimed by IS who consider Shia to be heretics. Saturday's attack targeted a vehicle market in the Habibiya area of Sadr City which had been targeted multiple times in the past, AP news agency said. Fifteen people were killed and a further 35 injured, officials said. A police officer told the agency that CCTV "showed a man parking a white car and sneaking into a nearby tea kiosk. Five minutes later the car exploded." No group has admitted the bombing so far. Other attacks took place in the town of Madain, just south of Baghdad, and Taji to the north, as well as in two suburbs of the capital. 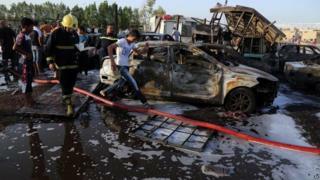 In recent months, dozens of people have been killed in bombings across Baghdad. In May and July, large car bombs exploded outside two prominent hotels. Earlier in the week, a top American general said the US should consider embedding American troops with Iraqi forces if progress was not made in the fight against IS. Raymond Odierno, the army's outgoing chief of staff, told reporters that such forces would have a support rather than a combat role. Can Iraq's army dislodge IS?